As we stated in our list of outdoor renovation projects with a high return on investment (ROI), you won’t get as much money back with the installation of a vinyl deck as compared to a wood deck. 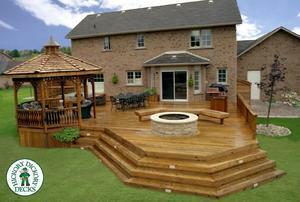 A wood deck has an average ROI of 80.5%. A vinyl deck is closer to 70%. Are you concerned that a wood deck won’t be as awe inspiring as a vinyl one? 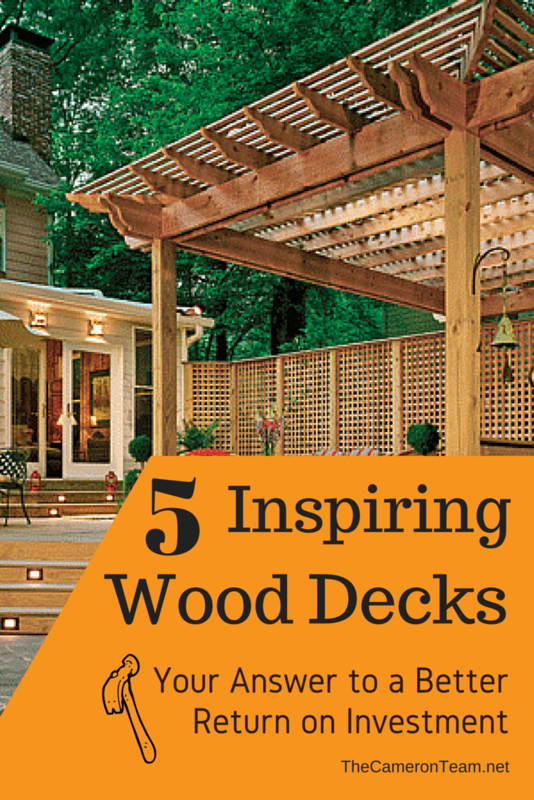 Here are 5 beautiful examples of wood decks! When Designer Brittany Fleming remodeled her ranch home, she wanted to add her own design flair. 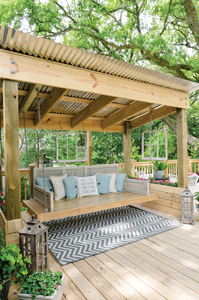 The Luke Phillips swing bed was her inspiration, which eventually led to a fully covered sitting area on her back yard deck. A metal roof and fans help keep visitors cool, while hanging window frames, a chevron rug, and pillows add a chic look. If you like coastal design, you’ll also want to check out the interior on Mobile Bay. Adding built-ins to a wood deck is a great way to leave an impression on visitors. This Old House has a great gallery of design ideas and his two-tiered deck with built-in planters is one of our favorite. 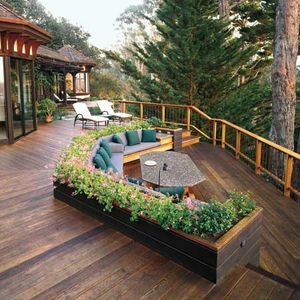 The planters, which line the back of a sitting area, is a wonderful way to add color to a large deck, while keeping it clear of pots that may eventually leave rings or get in the way of people walking. See the whole gallery on This Old House. This 1,400 square foot cedar deck was built by Hickory Dickory Decks. It has a spa, deck, gazebo, planter, sitting area, bar, and, best of all, a built in fire-pit; so there’s a little bit of everything. 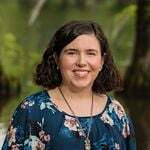 They have many years of experience building decks, so there is a great gallery on their website, which you can see here. Popular among newer homes, two-color decks are characterized by a wood color on the main walkways and white on the railings. This effect can be created with both wood and vinyl decks, so there’s no need to dish out extra money to get it. It’s even great for smaller decks. For even more examples of attractive wood decks, visit Jambic. Here’s another great one from This Old House that I stumbled across. Privacy is an important feature for decks, but you don’t always have the lot to achieve it naturally. That’s when it’s time to install a privacy barrier. This wood deck is a good example of how you can do this while keeping the design comfortable and classy looking. Need more home design ideas? You can see 25 of their most popular pins on their website. 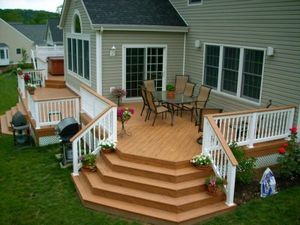 Need a Wilmington area deck designer or builder, give us a call or send us a message through our Contact page. We’d be happy to refer you to a reputable professional.